Finals week: time to study, stress, write final papers aaaaaaaand get sick. Invariably, if you're a lupus patient. The stress alone will cause a flare, and you're lucky if it's a minor one. Unfortunately, this term I've had the pleasure challenge of dealing with a "normal illness." In other words, I have a sinus infection. Again. Given all the immunosuppressants I take, it's no surprise that I get these %#$@ infections on a fairly regular basis. 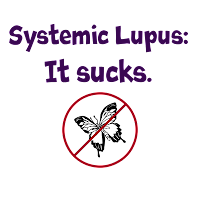 But here's the thing that healthy people may not know: when you have lupus, there's no such thing as "just" an infection. Because any type of infection will throw you down the dreaded rabbit hole, which (in defiance of the laws of nature and physics) turns out to be an infinitely circular. The circle goes something like this: 1) Suicidal immune system tries to kill body (i.e. lupus or some other autoimmune disease). 2) Doctors give you drugs to knock out the Suicidal system in question. 3) Turns out that if you kill the immune system, you get sick very easily. 4) Getting sick ramps up the stupid Suicidal immune system which is trying to fight the infection (good), but ends up also trying to kill you (bad). So a minor sinus infection turns into a sometimes-lifethreatening situation as the doctors are stuck between wanting to stop your immune system from killing you and wanting to leave enough of it intact to let it kill germs. They're never able to get this balance right, because of that whole "Suicidal" thing. So, in my case, the number of platelets I have (those are the parts of the blood that heal wounds and stop you from bleeding to death) plummets like a rock. This time I've been lucky, relatively speaking. I'm right on the border of where the doctors start freaking out. In the past sinus infections have put me in the hospital and made me get a platelet transfusion. No bueno. So, apologies for any comments un-commented upon, emails unreturned, etc. My body is ricocheting between "SLEEP NOW!" "Too. Much. Pain. and "Nom nom nom platelets." Plus, of course, there is that whole finals thing to deal with. #Lupussucks. All I can say is that in the next life you deserve the luxury top of the line model body after dealing with everything you've dealt with here!